The G.O.O.D. Music team are knee-deep in Big Sean's new video, and I'm loving it. Putting down his mic and picking up a football Big Sean alongside producer DJ Mustard and more other famous faces, take up the roles of quarterbacks, safety, outside linebacker and other football positions in his new video to ‘I Don't F-ck With You’. Leader of the pack is Kanye West who shows off his coaching skills in the video, with radio host - Big Boy taking up the role of the news correspondent and label mate - Teyana Taylor as a cheerleader. Featured on the song (whom we all believe is directed to Sean's ex-fiancé Naya Rivera), E-40 is the commentator and sits in the commentators booth of the college football game. All whose roles help bring the video to life. 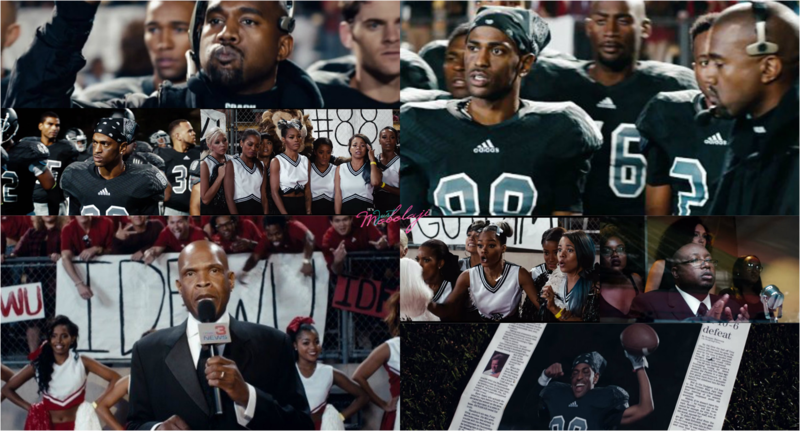 The creativity of the visuals was put together by director Lawrence Lamont, where we see Big Sean's team losing in the beginning scenes and we see the star player - Big Sean himself, a bit off track during the game. Eventually coming to his senses half way through the game Big Sean gets back on track and brings his team to victory, with the help of his passionate coach - Kanye West, and team members. And of course, whenever there's a star player - the groupies follow. Big Sean's ex in the video who ditched him for the rival team runs back to him after the win, as well as another female from the other team and he lets them both know that he doesn't f-ck with them, rightfully so. ‘I Don't F-ck With You’ is the lead single off Big Sean's new album of no title or release date, but is rumoured to be due later on this year. Ariana Grande, if you f-ck it up, just know that the next song is about you.